It is still the longest running magazine in Ireland and its first copy was published on 26th November, 1902. It came at a price of just one penny. It is a general magazine and its readers are of all age groups. They can thoroughly enjoy themselves while reading the magazine. Ireland's Own magazine specializes in traditional stories, lightweight content, uncontroversial family content, jokes, puzzles, riddles, recipes and lots more. Though many people think that Ireland's Own magazine is still in the old fashion manner but, for some readers it simply reminds them about the fun they had in their good old days. Are you thinking what makes this weekly magazine so popular? Its old-fashioned and non-glossy look makes it stand out on the book stalls. It is a non political and fully family oriented magazine. More than 50,000 copies of Ireland's Own are sold on weekly basis, giving complete rivalry to their modern glossy competitors. Ireland's Own is the best magazine to read if one is interested in knowing about the complete and detailed history of Ireland's culture and traditional values. Ireland's Own magazine epitomises everything that is great about the beautiful country of Ireland. The magazine doesn't have any airs or graces, it is packed with charming, informative, often humorous pieces and all well written. Ireland's Own has traditional Irish values and that means it is a refreshing alternative to today's frantic pace of life. To get a true insight and taste of what Irish culture is all about I would strongly recommend getting your hands on a copy of this magazine. l bought this for my uncle and he simply raves about it looks forward to it's delivery every week. The person I purchase this magazine for as a gift loves it! It has a wide variety of articles about many different parts of Ireland. Full of so much stories, a great mixture for all age groups, I just love it. It is great being able to get a local magazine from N.Ireland on our door step in Scotland. I enjoy the magazine. It is different from any we have in the US. I enjoy the variety of articles. I love it as it's not like the usual magazine full of celebrities and fashion. I like the wide variety of articles in the magazine. My Mother likes reading stories about Ireland from 1920-1960. Ireland's Own is so reliable with down to earth stories for young and old,delighted too with Unique Magazines for supplying it in its original paper format,all the best for 2016. My Mum and Dad love this magazine. We have been reading this magazine for years. It keeps us in touch with Ireland, the issues are topical and interesting. Stories are good, plus the children's are,puzzles etc. Dad is from Tipperary and he used to get it sent over to him hit and miss, but now he has it weekly on his doorstep - loves it! Reminds me of Ireland, where I have spent many happy holidays. This was bought for my Mum and she is absolutely delighted with it and looks forward to it being delivered to the comfort of her own home each week. 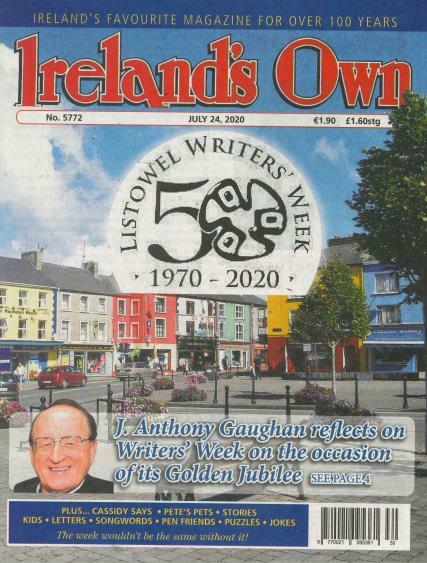 I subscribe to this magazine for my mother, she is 84 years old and really enjoys reading Irelands Own every week. I buy it for my Mother. She enjoys reading all parts of it and especially the stories on a Saturday morning. I love this magazine as it has lots of wonderful reading. I have found many really interesting articles and think the section for children is great and a rare thing in these times. Thank you to all concerned. Traditional, wide appeal & timeless application!! The magazne itself is excellent - my Granny reads it from cover to cover every week and is delightd with it.